This is a mezuza written according minhag chabad. The chabad custom is to leave 9 yudim, both after uvshearecha and before vehaya. The problem related here is relevant also to shiyur parsha in a sefer tora. How do we measure the 9 yudim, [compared] against the line below or above? I think we should measure against the line above, bein lekula bein lchumra (although obviosly lechatchila the 9 yudim should be recognized against the line below as well, but that is not me'akev). This may differ from a revach parsha pesucha which is at the end of the line, and revach parsha setuma [according Rambam] that is at the beginnig of the line [9 letters before vehaya], there the measure should be both in regard to the line before and after. I tell my sofrim who write minhag chabad to leave a space corresponding to the whole word letotafos from the line above, ie the uvisharecha should end before the lamed (of letotafos) on the line above. 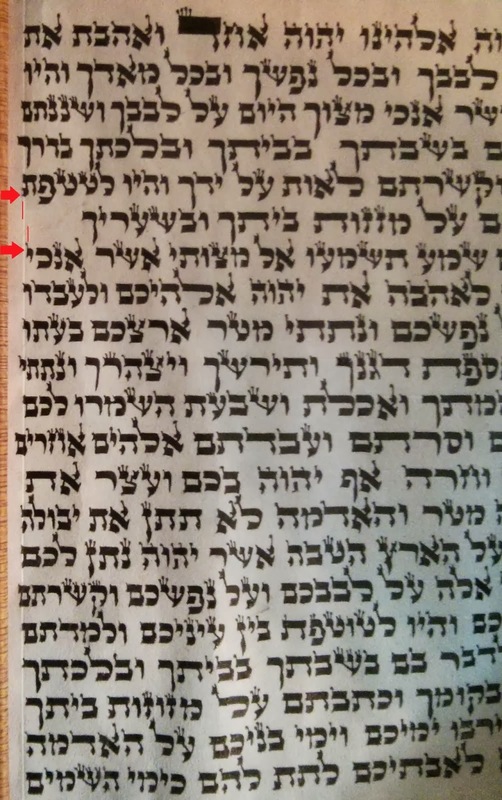 However I was taught that it is ok when checking for chabad, so long as there is 1.5 times the vertical space between the sirtut it is Ok and not to make an issue for the customer since you can usually fit at least 6 uvei kulmusim between two sirtutim so 1.5 sirtutim is still ok. Therefore the mezuzah above would be OK for minhag Chabad - just.